Q. What are Toppik Hair Building Fibers made Of ? A. Toppik Hair Building Fibers are made of Keratin protein - the same thing that makes up human hair. The Keratin protein comes from a natural wool source, which is the closest match to human hair. Learn more about how Toppik Hair Building Fibers work why ours stand apart from the rest. A. Toppik Hair Building Fibers stay firmly in place even in wind, rain and perspiration. For even longer-lasting results and added shine, use Toppik FiberHold Spray. A. Toppik Hair Building Fibers do not encourage or discourage hair growth. The natural Keratin Fibers will not clog pores or affect a scalp condition. A. Toppik Hair Building Fibers stay until you wash your hair. They may shift but can be easily touched up. Many individuals who go to the salon weekly for a shampoo/set or a blow out will leave the Fibers in until their next appointment. A. It is recommended that Toppik Hair Building Fibers be applied after the use of any styling tools such as hairdryers, flat irons or curling irons. 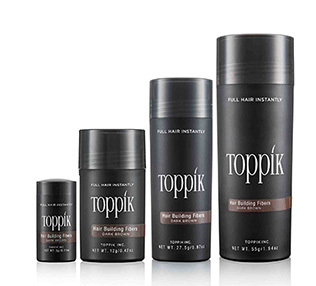 Styling products (other than hairspray) should be applied to the hair prior to applying Toppik Hair Building Fibers. Applying gels, mousses, pastes, serums, and the like after applying Fibers may cause shifting the Fibers and could expose the areas that were meant to be covered. Let styling products dry before applying Fibers. A. The irregular teeth and unique design of the Hairline Optimizer are ideal for naturally framing the areas around the face, including the forehead and temple areas. This tool also keeps Fibers from getting onto the forehead when applying Toppik to the front hairline. A. Toppik FiberHold Spray is specifically formulated to lock in the Fibers for those looking for added hold as well as shine. A. Remove the Spray Applicator from the Toppik Hair Building Fibers bottle and rinse inside and out with flowing hot water. Let dry, and place it back on the bottle. If it still doesn’t dispense Fibers, please contact Toppik Customer Service by calling 1-800-THICKEN (844-2536). Q. Do Toppik Hair Building Fibers work on ethnic hair? A. The texture and appearance of the Toppik Hair Building Fibers work well with ethnic hair. Q. CAN I MIX DIFFERENT COLORS OF TOPPIK HAIR BUILDING FIBERS? A.Yes, you can mix different shades of Hair Building Fibers. In fact, it is often encouraged to mix different shades in order to find the closest match to your own color, especially when working with blonde or gray hair. The product can either be mixed directly in the hair (use the lighter color first, and then layer the darker color over it). See all colors and additional color tips here. A. COUVRé does not encourage or discourage hair growth. Its gentle formula cannot clog pores or affect your scalp condition. A. Yes. It’s completely waterproof. Q. If it begins to rain, will Colored Hair Thickener stay in my hair? A. Colored Hair Thickener stays firmly in place through wind, rain and sweat. Q. Does Colored Hair Thickener affect hair growth? A. Colored Hair Thickener does not encourage or discourage hair growth. It won’t flake or rub off, and doesn’t clog pores or affect your scalp condition. Q. How long does it stay in the hair? A. Colored Hair Thickener stays on until it is shampooed out. A. Use hot water and/or a pin, and be sure to always shake the can before applying Colored Hair Thickener. Q. Is Colored Hair Thickener safe for color-treated hair? Q. How does the 30-Day Money Back Guarantee Policy work? A. We want you to be 100% satisfied with your purchase, and we stand by the quality of our products. Try any product risk free. If you don't think an item is as effective as we've said it would be, simply return the container, even if it's completely empty, within 30 days of receiving your order, using our easy return process outlined below. We'll refund the entire purchase price less shipping and handling, no questions asked. Please see how to process returns below. Q. How do I process a return? A. We offer a 30-Day Money Back Guarantee policy on all orders. Simply call us at 1-8OO-THICKEN (844-2536) within 30 days of receiving your shipment for your Return Merchandise Authorization (RMA) and include it on your return label.Shipments without an RMA will not be accepted for returns. Shipping charges are not refundable. Other conditions may apply. Please contact us for details. A. Orders are normally shipped by US Mail and may be sent to street addresses or PO boxes. Delivery of items normally takes 7-10 business days. See more information on all shipping options. To check the status of your order, please call us at 1-800-THICKEN (844-2536). Q. Are Toppik sales and promotions eligible to all customers? A. Unless specifically stated otherwise, all sales and promotions are only eligible to Toppik customers in the USA and Canada.